The W-1500’s combination of solid HDMI wireless performance, appealing picture quality, flexible placement and affordability make it a value leader in its class. In recent years, setting up a projection-style home theater has gotten a whole lot more affordable. 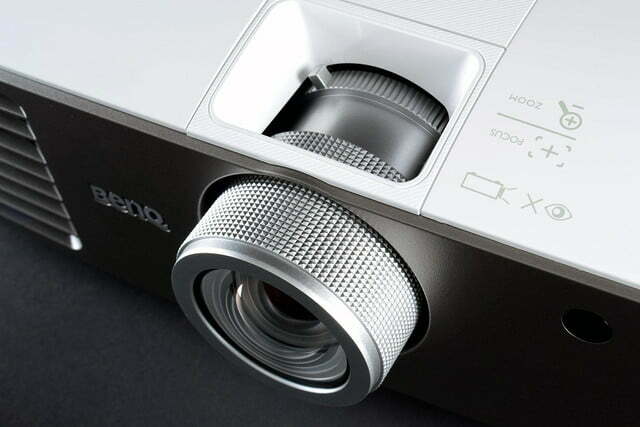 Still, even as projectors have gotten less expensive, the budget models have left something to be desired in either the picture quality or features department – sometimes both. That’s all beginning to change. These days, if you’re willing to spend just a hair over $1000, you can get a projector that will not only knock your socks off with a high-contrast, brilliantly colorful picture, but give you more features and flexibility than you could ever have expected from a $2,000 + projector just a few years ago. 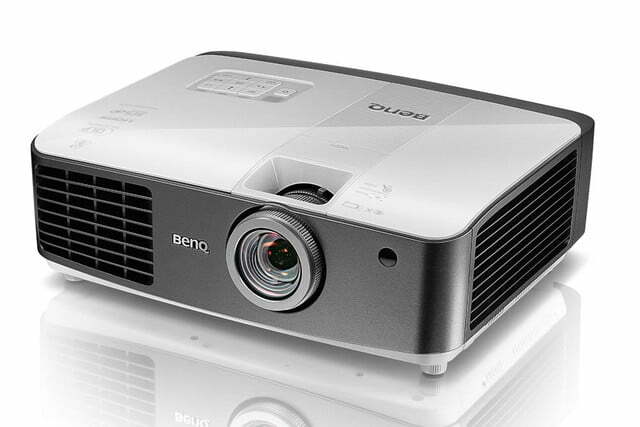 Such is the case with the BenQ W1500, a projector that, at $1250 online (at the time of this review), offers high brightness (up to 2200 Lumens), 3D capability, vertical lens shift, ISF calibration controls, and wireless HDMI transmission. 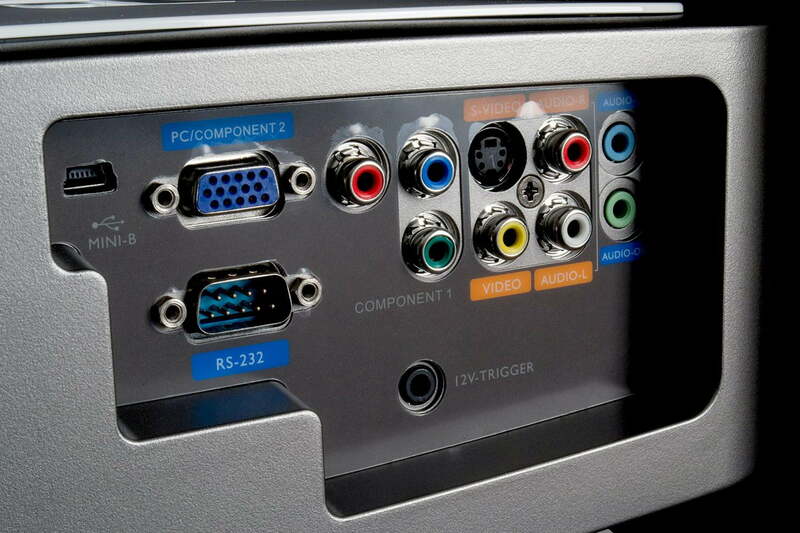 That’s right, the W1500 affords users the ability to skip the lengthy HDMI cable runs and all the hassle that can come with them when installing. Just get power to this projector, plug an HDMI dongle into the HDMI output of an A/V receiver, and go toss some popcorn in the microwave, right? Well, that’s the idea, anyway. The thing is, wireless HDMI can be a dodgy proposition, so we gave the W1500 a thorough test to see if it really is the plug and play solution it purports to be. There’s something irresistibly friendly about the purple box the W1500 is packaged in. It calls to mind Roku’s affinity for purple and, along with it, the notion of simplicity and intuitiveness. Beyond the glossy purple cardboard sits the W1500, which looks and feels like a step up from, say, the Viewsonic PJD-7820HD ($700), and more along the lines of the Epson Powerlite Cinema 3020e ($1800). 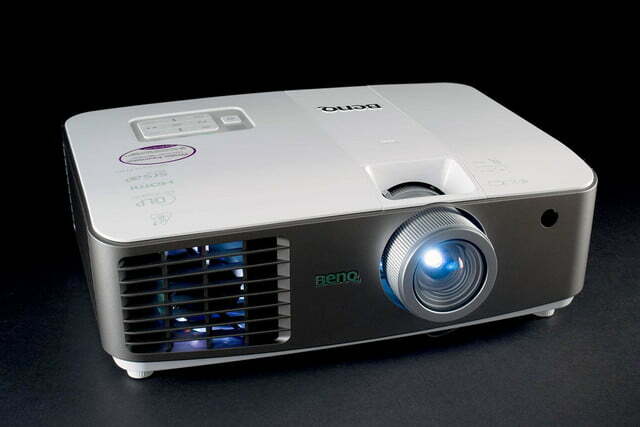 The projector has a glossy white shell up top, with a grey band stretching around its sides. 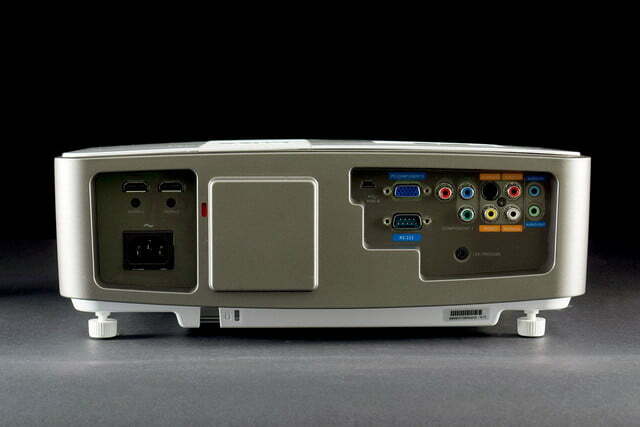 The W1500 weighs about 8.5 lbs and measures 9.8 x 13.3 x 4.7 – inches. In the box with the projector we found a power cable, HDMI transmitter dongle, a dual-headed USB cord, a carrying case with shoulder strap, and a wand-style remote control. 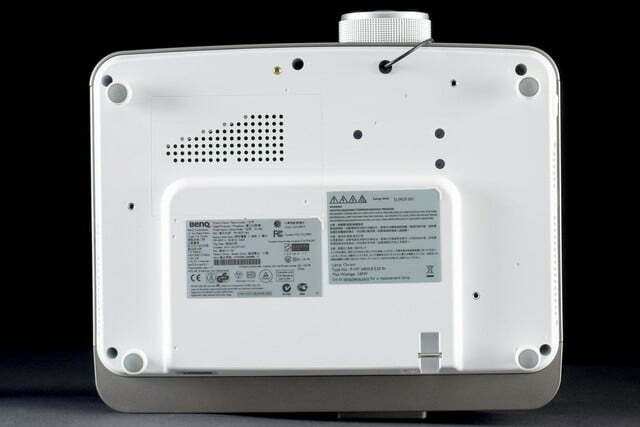 Taking a closer look at the W1500, we were pleased to see two IR sensors, one at the projector’s front, and another on its back. This should make controlling the projector from various locations in the room a bit easier. We also couldn’t help but notice three different fan locations, one at the projector’s front-right corner, another toward the front on the right side, and another toward the back on the left side. 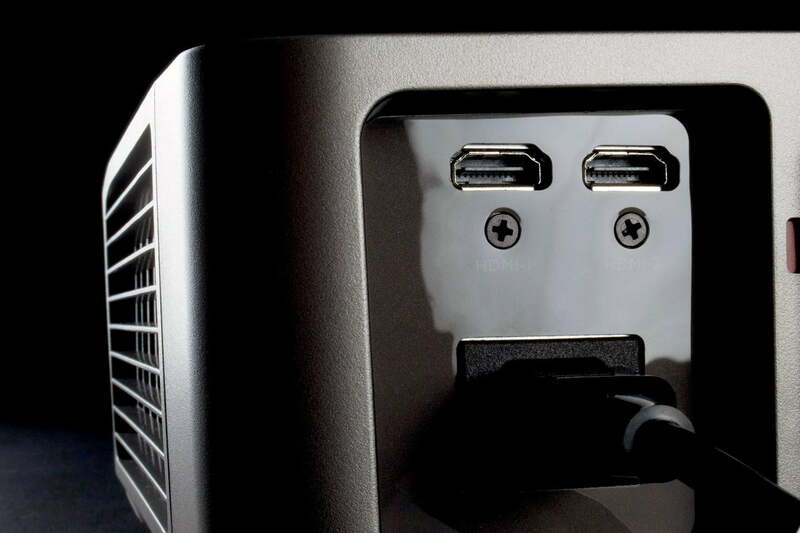 Without plugging it in, it would be easy to think the W1500 could be a rather loud projector (spoiler alert: it isn’t!). Near each of the two side-facing fans we saw what appear to be 1.5-inch drivers (BenQ doesn’t disclose the size, only that they are powered by 10-watts each). Somewhat humorously, BenQ suggests on its website that the two speakers could help users “save money (or extra costs) by eliminating the need for Hi-Fi or external speakers.” Yeah … not even close. More on that later. We’ll address what many might consider to be the W1500’s most interesting feature first: wireless HDMI. 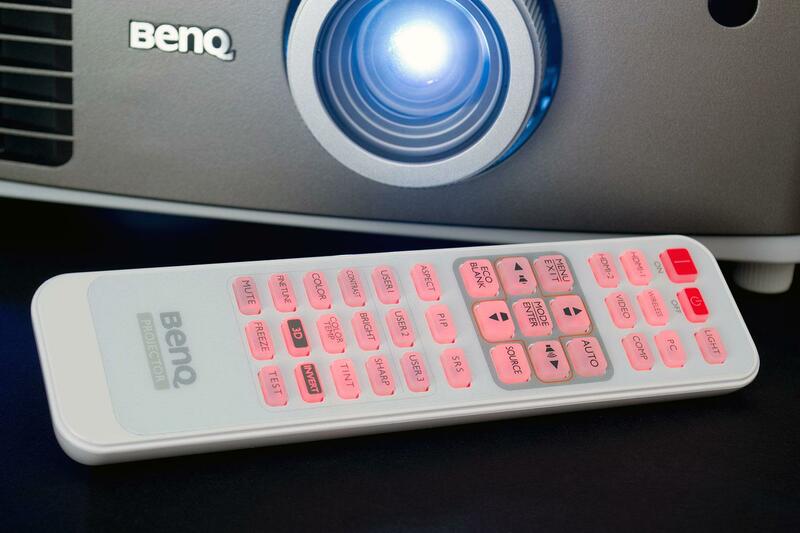 BenQ has opted to go with a transmitter and receiver that operate in the 5GHZ wireless range, most likely to mitigate the potential for interference from other wireless devices in the home. The dongle is a little larger than a Chromecast dongle or Roku Streaming Stick, but like those devices, must be powered via USB. This can be done using either an included USB wall adapter or, presumably, the USB output on a computer, A/V receiver, Blu-ray player, sound bar or any number of other devices. 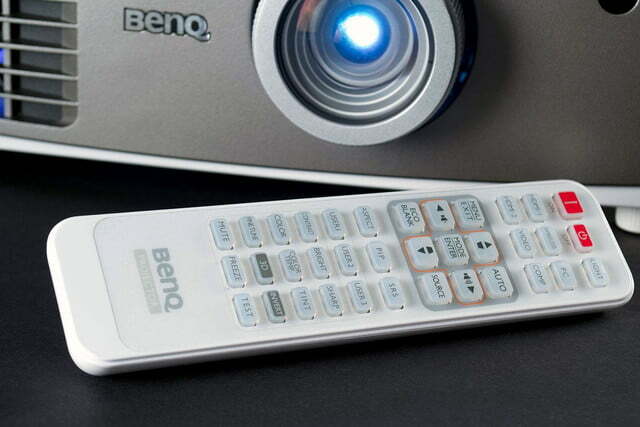 Vertical lens shift is another feature worth noting, as it’s rarely seen in projectors at this price point. For those not familiar, vertical lens shift allows you to shift the image up or down for those times when precise placement or installation isn’t possible. The W1500 allows you to shift the image by 110 -130 percent, which isn’t a huge swing, but came in handy for our reviewing purposes. 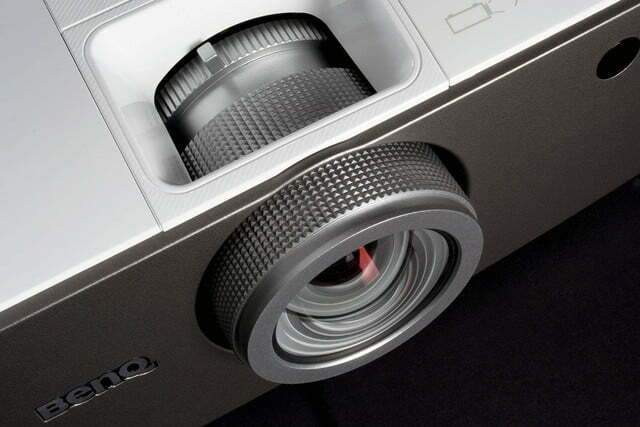 The W1500 has a 1.6:1 manual zoom lens, which means you can get an 84-inch 16:9 image from it at 6-feet, or a 100-inch image out of it anywhere from 8 – 12.5 feet – versatile enough for some pretty small rooms. And with up to 2200 possible lumens, you can expect to get a ridiculously bright picture from images 200-inches and larger in a dark room. Of course, that’s not what the added brightness capabilities are for. The idea is that the W1500 should be able to hang in a moderately well-lit room without getting washed out. 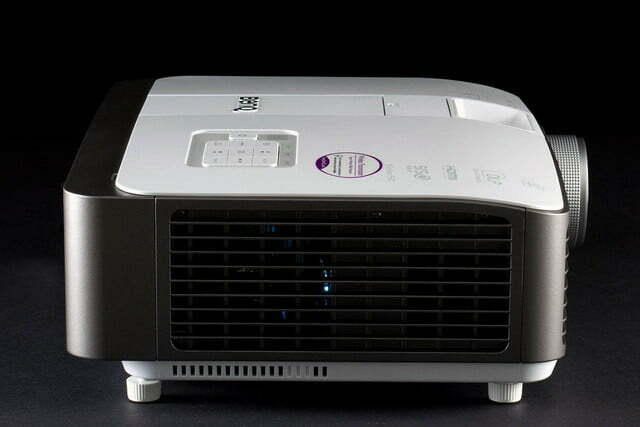 Since the W1500 is a DLP projector, those typically sensitive to DLP’s “rainbow effect” should be cautious about considering it, though we can say that the projector’ss use of a high-speed color wheel did much to mitigate the effect (though, to be fair, this reviewer is only moderately sensitive to the rainbow effect). Especially sensitive viewers should probably just steer clear of DLP projectors entirely and go with an LCD-based system. One feature we might normally gloss over is the W1500 frame interpolation, which essentially inserts digitally manufactured frames in between native frames in an effort to reduce judder and blur. In televisions, this same processing produces the dreaded “soap opera” effect, and it will in this projector as well if you crank it up. But on its lowest setting, we found that frame interpolation removed just enough judder to be appreciable, but not enough to over-smooth the motion. This was handy to have when watching fast-moving sports and movie scenes. The W1500 doesn’t require an expert’s setup chops, though it will certainly benefit from them. In addition to providing all the necessary ISF controls, the W-1550 offers an ISF Day and ISF night mode. There are also three user-accessible pre-sets, so DIY installers can create enough varied settings to satisfy a number of ambient light scenarios. The W-1500 should be able to hang in a moderately well-lit room without getting washed out. 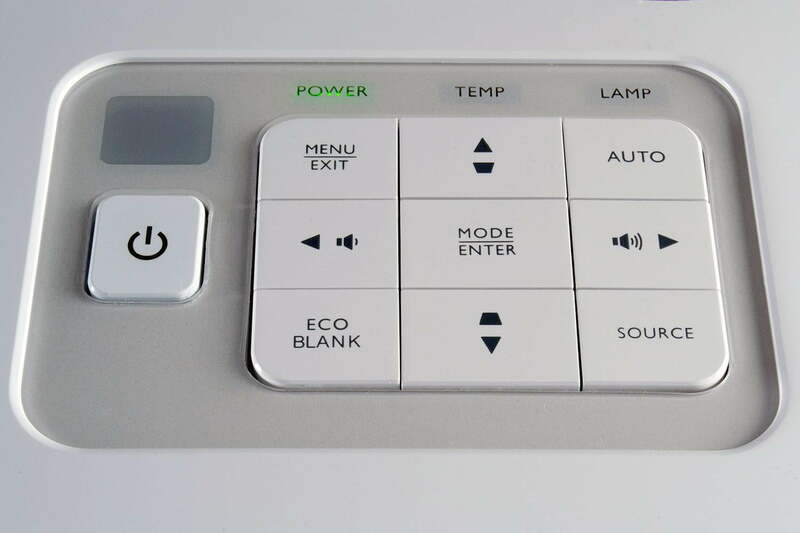 For our review, we stuck primarily to the W1500’s “Cinema” setting, which is meant to reduce the lamp’s maximum output to 1700 lumens, which was more than enough in our darkened room, and almost enough in our brighter room. In our dark room, we engaged Eco mode, which we found not only quieted the projector down a little (it wasn’t very loud to begin with) but also generally improved black levels. Our only complaint with Cinema mode was that skin tones didn’t appear as natural as we’d have liked them to, taking on just the slightest bit of a green tinge. Less scrutinizing viewers aren’t likely to notice this at all, though. For this review we mounted the W1500 using Omnimount’s excellent PJT40. Screens used included a 100-inch Da-Lite retractable and a 110-inch Da-Late motorized model. During our review we alternated between hard-wired HDMI connection and the built-in wireless connection. Without any adjustment, the W1500 looked solid in Cinema mode. Aside from a slight green tinge that most of our guests never noticed, we enjoyed bright colors, excellent white brightness, and better black levels than we expected, all contributing to a picture with enjoyable contrast that gave the impression of a generally high quality image. The one area we felt the W1500 should have fared better was in regards to shadow detail. We felt there was some crushing of blacks going on, most evident in dark scenes in movies like Prometheus, Harry Potter and The Dark Knight Rises, where certain details were simply lost. With that said, we were able to turn off our critical eyes and get enveloped in several new movies we hadn’t seen before. For us, a litmus test for how average viewers might react to a television or projector is to watch content we’ve not yet watched and see if we get distracted. That never happened with the W1500, and, for that matter, all we heard from our guests were compliments. 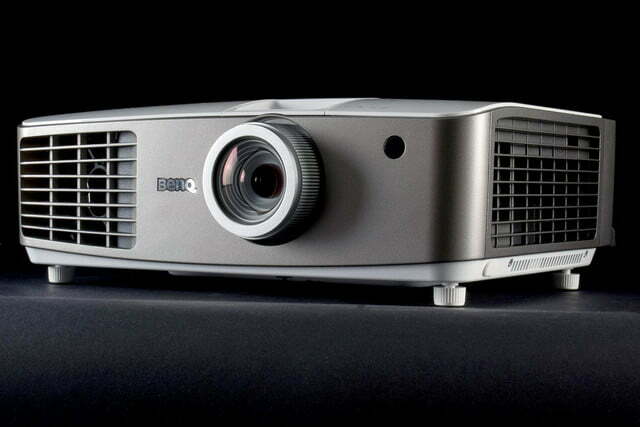 For what is essentially a mid-level home entertainment projector, the W1500 delivers on picture quality. From here, the question for us was how well it does over wireless HDMI. Getting the W1500 set up for wireless HDMI connection took more time than we’d have liked. First off, pairing the projector with the included wireless transmitter dongle is a process involving more steps than seems necessary. You’ve got to pop into the projector’s wireless input, enable wireless search, then press a weird combination of buttons to pull up what looks like a DOS-based menu to add a wireless device. At this point, all controls except those for adding or removing a wireless device are disabled. 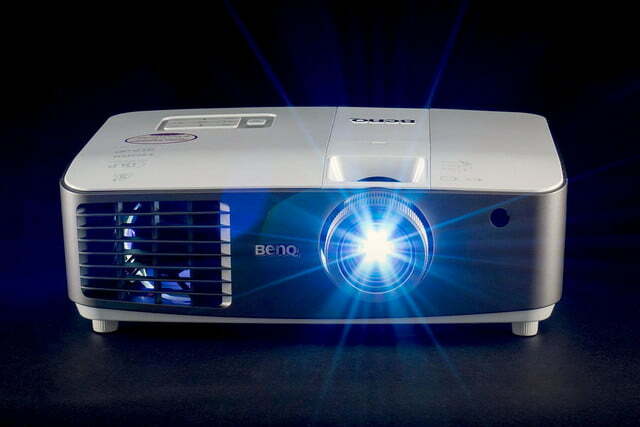 So, if the pairing doesn’t go well right away, you’re stuck turning the projector off, which takes nearly a minute and a half, then power it back up, which takes a fair amount of time as well. Then, you can try again. Getting the W1500 set up for wireless HDMI connection took more time than we’d have liked. We went through this process several times, ultimately requesting a replacement HDMI transmitter from BenQ, which the company graciously expedited (in fact, BenQ’s support was outstanding at every turn). But, even with the new transmitter, we continued to have problems. In the end, it took plugging the HDMI dongle’s USB power cable into a wall adapter to get it to pair with the projector. 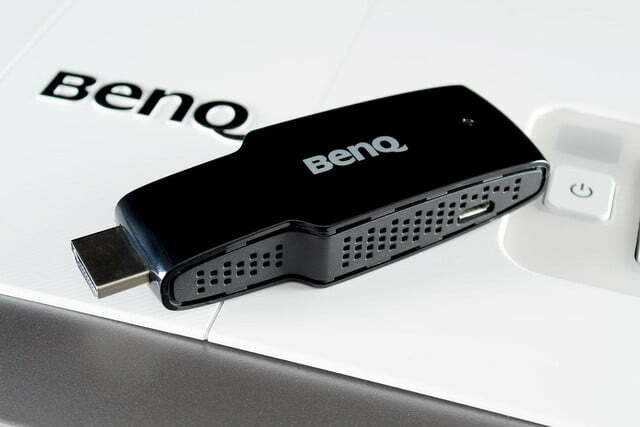 BenQ ran its own tests and reports that it wasn’t necessary for them to do the same, and that the dongle ran just fine, so long as both USB connections were plugged in. Once the two devices were synced, though, we were able to connect the USB cable to our laptop or Blu-ray player’s USB output and make the connection reliably, no wall adapter necessary. Still, the hassle got us wondering: Why not just pair the two at the factory and send the whole kit out the door ready to go right out of the box? Once it was connected, we were fairly impressed by the image quality. We didn’t experience any signal dropouts, compression was minimal, and we didn’t notice any large blocking or pixelization, even during scenes that clearly required a great deal of bandwidth. We even tried to disrupt the signal by blocking line of sight, but that never worked. In the end, we had to move the transmitter well over 35-feet away and around the corner to get a messy looking picture. This was a stable enough performance for us to say that the wireless HDMI system in the projector is probably going to be satisfactory for most users. With that said, having a plan B in place just in case it doesn’t work in your particular installation would be a good plan. 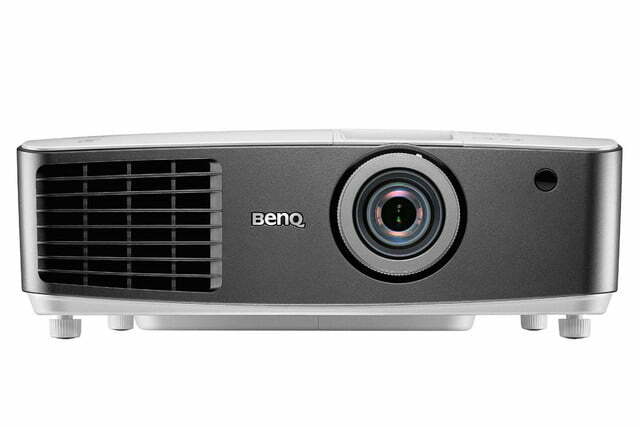 We normally wouldn’t go out of our way to make disparaging remarks about a projector’s sound quality – projector speakers are universally bad – but with the marketing copy BenQ has on its website, we felt it necessary to point out that the speakers built into this projector sounded worse than our laptop’s built-in speakers. Granted, our Asus Zenbook Prime has better-than-average speakers, but that still doesn’t raise the bar too high. 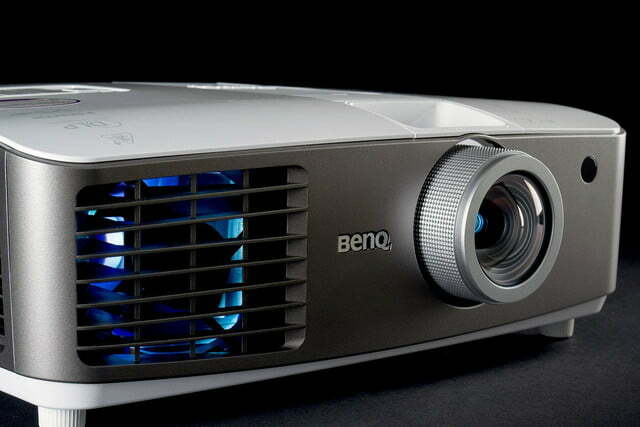 Bottom line: put no stock into how this projector sounds. That’s not it’s job, anyway. 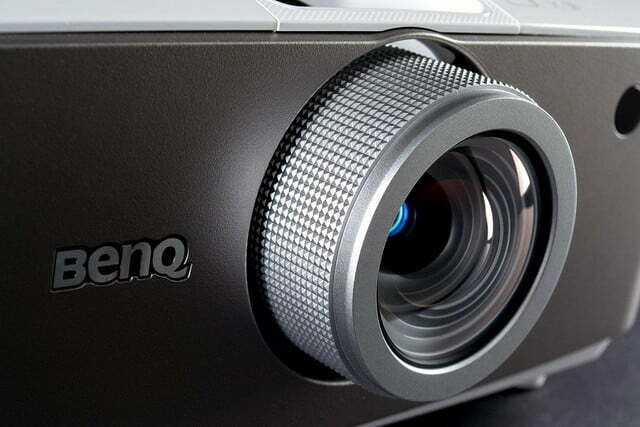 We have been plenty vocal about our disdain for active-shutter 3D systems in the past, be they a part of a projector or a television, and the W1500 didn’t do anything to change our minds. Using the one pair of provided 3D glasses (glasses cost $100 from BenQ), we auditioned three selections of 3D material on Blu-ray. What we experienced as a 3D image with a good deal of crosstalk problems, and a whole lot of eye-crossing due to depth issues. Had we been able to back the effect down a little, this may have been less of a problem, but most of the time we just sat there feeling dizzy. We’ve said it before, but it bears repeating: If you’re going to do 3D in the home, it ought to be on a bright, 4K television, and with passive 3D glasses. For most consumers, pulling off passive 3D at home the way they do in commercial theaters is cost prohibitive. Active-shutter 3D isn’t the answer. So, while the W1500 didn’t fare particularly well in this test ,we’re going to give the projector a pass, because we consider it a superfluous feature anyway. At the end of the day, we tend to prefer Epson’s Powerlite Cinema 3020e projector, even if it is a good $600 more expensive. 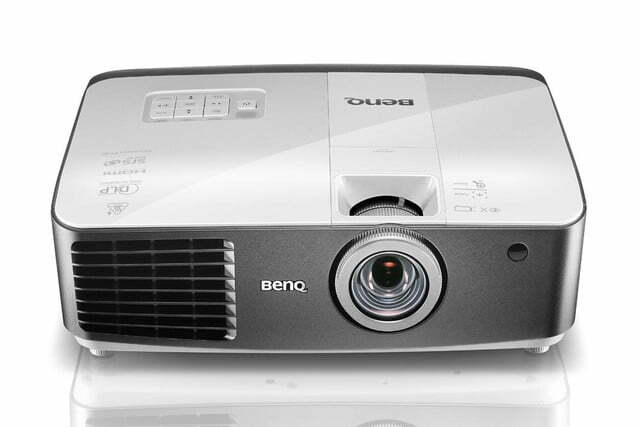 With that said, the BenQ W1500 is an great projector in its own right, and its included wireless HDMI connectivity, once set up, is reliable and of reasonable quality. 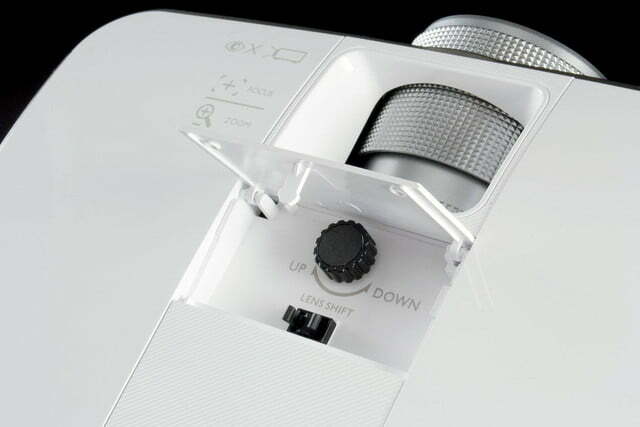 We also tremendously appreciate the little bit of vertical lens shift this projector affords, making it a bit less temperamental during installation. 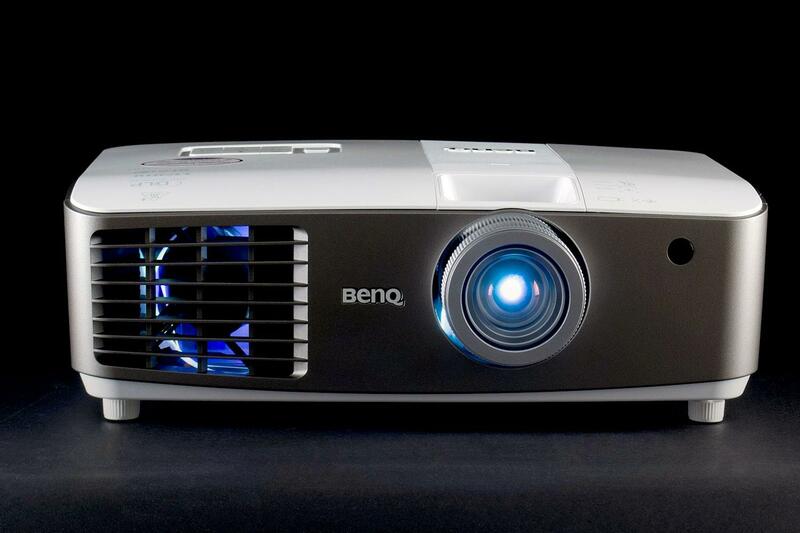 Add it all up, and the W1500 makes compelling case for itself as the projector of choice for someone looking to put together a full-on home theater without breaking the bank. With the money saved, one could invest in ambient light control or an upgraded audio system to really bring the big screen movie experience home. Overall: a solid buy.